.. . . Mitch Germansky . .. . Drums & Percussion . . .. Photos: C.Golinski, E.Mandel Age six starts studying drums with his dad, Al, the well-respected professional drummer and renowned teacher. Focused on classical percussion, jazz,and rock, he plays with various bands during his K-12 years. As a young teen he starts teaching drums and playing professionally while also performing with the NJ All-State High School Band and Orchestra, and the first All-State College Jazz Band. Mitch pursues a BA in Math and MS in Computer Science embarking on a journey as a computer scientist in the 70s. 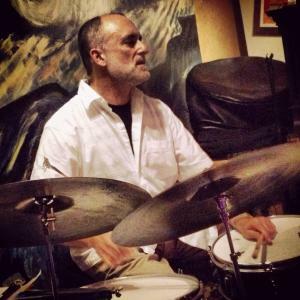 During the past 40 years he's devoted to computers, teaching, and drumming in diverse musical settings including jazz, rock, classical, shows, dance bands, club dates. Mitch resides in Berkeley Heights, NJ. In the tradition of my Dad, Al Germansky originally teaching in Newark and then West Orange, instruction is focused on theory, technique, and practical playing from classical to contemporary styles. Materials include original works from Al Germansky along with an array of classic drum books including Joel Rothman's books. I've known Mitch Germansky for eleven years. He's an accomplished percussionist who can play in various styles: regimental/traditional, concert, jazz, and pop. He performs regularly in various groups throughout Central Jersey and is just as handy on a regimental snare drum as he is on a drumset. Mitch is a big supporter of music education for all, and this is most evident by the continuing musical lineage that exists in his family. He is a thoughtful and conscientious human being that would serve the novice or advanced student very well. Contact mitch @ germansky.org to book a band for any occassion or to explore drum instruction.